What a neat way to touch the life of a child! 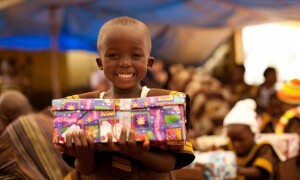 For years, TSMC has participated in the Samaritan’s Purse, “Operation Christmas Child.” Operation Christmas Child is a way to share the love of Christ, and the testimony of Samaritan’s Purse is that many children have embrace Christ because of this ministry. Though the individual person packing the shoe box to be given out on Christmas to the poor children of the world, God knows who will get what box. We pray before shopping, asking God to lead us to the right items to put into a shoe box. W e pray as we pack the boxes believing that God will get the right box to the right child. The smiles on the faces of the children tell the story. Don’t sit back and watch, get into the action. Pray, buy, pray, pack, pray and believe in the power of God’s love to change lives.